Bert Monroy paints with pixels. His canvas is a monitor, his paintbrush is a stylus, and his art looks like you took an HDR-panorama photo of a vivid dream. When you look at his paintings, you can see every tiny detail in the scene without depth of field or frame distortion—the effect aims to be more true-to-life than mere photographs. 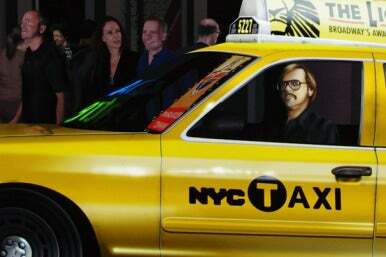 Portrait of the artist as a young cab driver. Bert Monroy depicts his younger self in Times Square. His latest piece—called Times Square—is a gigantic painting of the New York City thoroughfare, measuring 5-by-25 feet. It has a breathtaking 750,000 layers and took four years to complete. Monroy’s masterwork is on display at the Photoshop & You exhibit in San Francisco, where this week the artist described his vision and process to an enthralled audience. Like the professor he is, Monroy recounted how he fixed every detail in the image—from the billboards of Times Square to the lamps in the hotel rooms. Each element—like a streetlight—was comprised of dozens of layers, making the final Times Square file 6.52GB. Printed on Epson’s DisplayTrans Backlight Media with an Epson Stylus Pro 11880 printer, the painting is designed to be illuminated from behind. Its neon, billboards, and streetlights shine out at the viewer, engulfing the senses, like the real Times Square. Monroy envisioned his Times Square panorama to closely resemble the real New York scene. Everyone in the picture looks as if they are off in their own little world—just like real New Yorkers. But Monroy’s interpretation of Times Square is something like Where’s Waldo for the digital imaging industry, as the street’s inhabitants are significant and specific. Photoshop founders, brothers Thomas and John Knoll, stand nonchalantly in foreground while Dan Steinhardt of Epson deals a fast game of Three Card Monte on the right side of the image. Artist Bert Monroy, after his presentation at Photoshop & You on July 26, 2011. Though he primarily worked in Photoshop to create Times Square, Monroy mapped the image in Adobe Illustrator, aligning vectors and using vanishing points that disappeared far off of the page. The Photoshop & You audience checking out the installation after Monroy's talk. 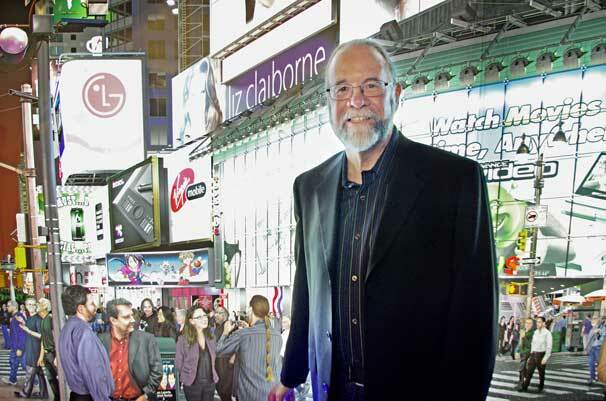 Monroy created Times Square on an 8-core Mac Pro, a 30-inch Apple Cinema HD display, and two 20-inch Wacom Cintiq touch-sensitive tablets. He used one tablet as his easel for drawing and the other as his pallet to hold Photoshop panels. To keep up with his workflow, Monroy had two Macs in operation—one for the large file, and the other for details that he could work on while the large file was saving. "Saving meant going to lunch,” joked Monroy at the Photoshop & You presentation. Bert Monroy is a professor at San Francisco State University and has written several books on Photoshop—and co-authored the first book ever written about the program. 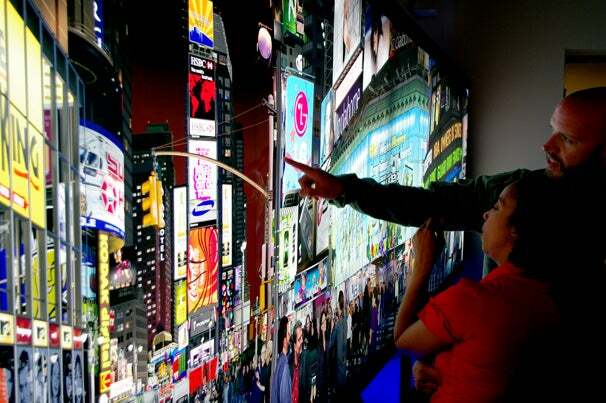 Times Square is on display at the Photoshop & You gallery at 550 Sutter Street in San Francisco until August 6. Admission is free.